SEOUL, South Korea — North Korea defied President Donald Trump and the world again by firing another ballistic test missile on Tuesday. It was the first missile launch since September and came as Trump and Senate Republicans were trying to pass a tax code overhaul. "We will take care of it," Trump said in response to questions about the latest challenge from Pyongyang. "It is a situation that we will handle." But Trump gave no details or signals of a change in strategy. So far the North Koreans have test-fired rockets 18 times since he took office in January. "Nothing changes, nothing changes," he said. "Very serious approach. Nothing changes." Later Tuesday, Nikki Halley, the U.S. ambassador to the United Nations, and her counterparts from Japan and South Korea requested an emergency Security Council meeting to deal with the latest provocation. That meeting will be held Wednesday. "Our nation will not bow to any provocations, and we will raise the pressure to its fullest," Japanese Prime Minister Shinzo Abe said. "The international community must unite and fully implement sanction measures." The North Koreans fired the ICBM (intercontinental ballistic missile) at 1:17 p.m. ET from a base in Sain Ni, North Korea, that traveled about 620 miles before splashing down in the Sea of Japan, a Pentagon spokesman said. "We are working with our interagency partners on a more detailed assessment of the launch," said the spokesman, Col. Robert Manning. Defense Secretary James Mattis said the latest missile "went higher, frankly, than any previous shot they have taken." North Korea's state television said Wednesday afternoon Pyongyang time that it tested a new, nuclear-capable ICBM that was "significantly more" powerful than missiles in previous tests, the Associated Press reported. North Korean state TV called the weapon a Hwasong 15. 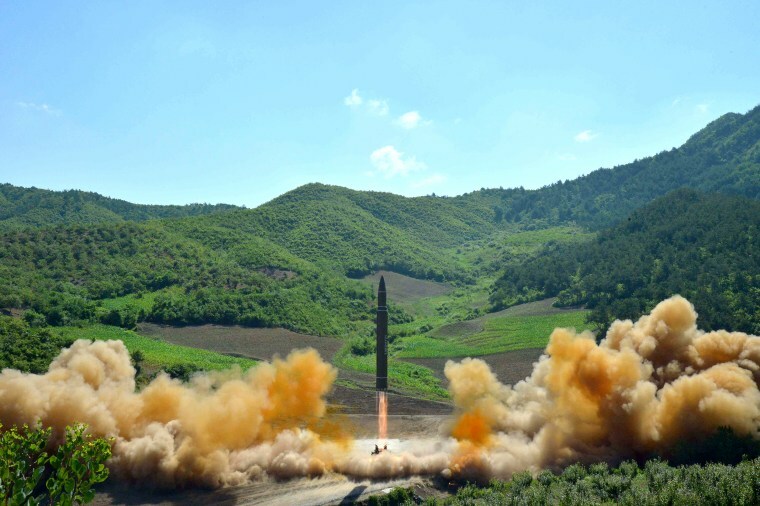 North Korea has tested ICBMs twice before, both in July. Those missiles were called Hwasong-14s. Two other North Korean ballistic missiles that were fired in May and June landed in the same waters as Tuesday's rocket. South Korea's military conducted a "precision missile-firing drill" in response to Tuesday's launch, a South Korean military official said. In September, Trump, in his first address to the United Nations, fired off some verbal missiles at North Korea. He threatened to "totally destroy" North Korean and derided the country's leader Kim Jong Un as "rocket man." Kim responded by calling Trump a "frightened dog" and “a mentally deranged U.S. dotard,” which is an arcane term for a senile or weak-minded elderly person. A short time later, North Korea's foreign minister warned that his country could test a hydrogen bomb in the Pacific Ocean to fulfill Kim's vow to take the "highest-level" action against the United States. So far Trump has been unable to get the North Koreans to comply with his demands to stop testing missiles. Stella Kim reported from Seoul, and Corky Siemaszko from New York. Stella Kim is an NBC News freelance producer based in Seoul.